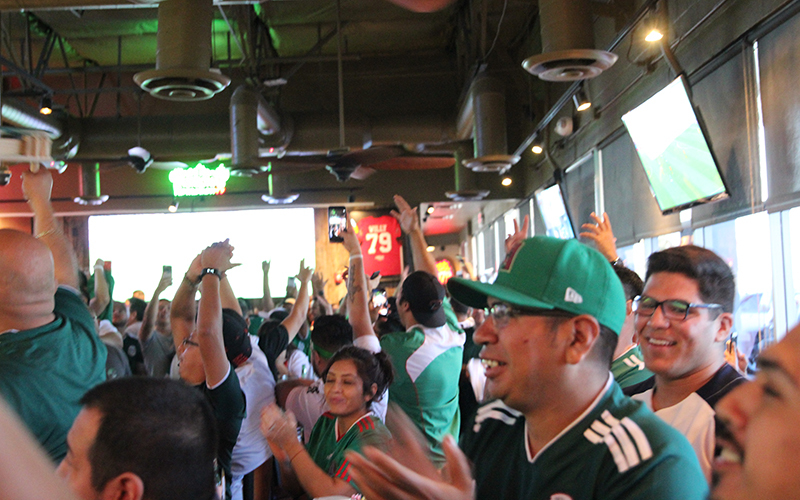 LAVEEN VILLAGE – It wasn’t even 7 a.m. when Adrian Zarate took a gulp from his red plastic cup and watched more Mexico soccer fans file into the Pancho Villa’s Army watch party at Native Grill and Wings. Although Mexico didn’t win, the place went nuts anyway as Wednesday provided the latest captivating moment of this year’s FIFA World Cup in Russia. Mexico advanced to the knockout stage of a tournament that has commanded national attention, despite the United States’ absence. All eyes will be on Mexico again for its Monday match with Brazil. When the U.S. men’s national team last winter shockingly failed to qualify for the tournament, some questioned if the 2018 World Cup would generate the same interest as past iterations of the event. But nearing its halfway point, this year’s Cup has become one of the most popular topics in the country — and the state. While television ratings are down compared to the 2010 and 2014 World Cups — thanks largely to unfavorable morning start times and the loss of U.S. men’s national team games — matches are still averaging over 4 million total viewers between Fox Sports (English-language) and Telemundo (spanish-language) while games with high-profile sides, such as Mexico or Germany, have seen nearly triple that amount, according to rating numbers reported by Sports Media Watch. Online, few stories have matched the World Cup’s interest. According to Google Analytics, a World Cup-related topic was one of the three most-searched terms in the United States all but one day since the event started on June 13. Three times during that span, a World-Cup related topic was the most-searched term of the day in the country and only the NBA Draft was searched more times in a day than the once-every-four years soccer world championship. According to Google Trends, the World Cup’s online popularity in Arizona is rated as the 14th-most of the 50 states plus the District of Columbia. One would only have to look as far as the PVA watch party at the South Phoenix bar on Wednesday to understand why. 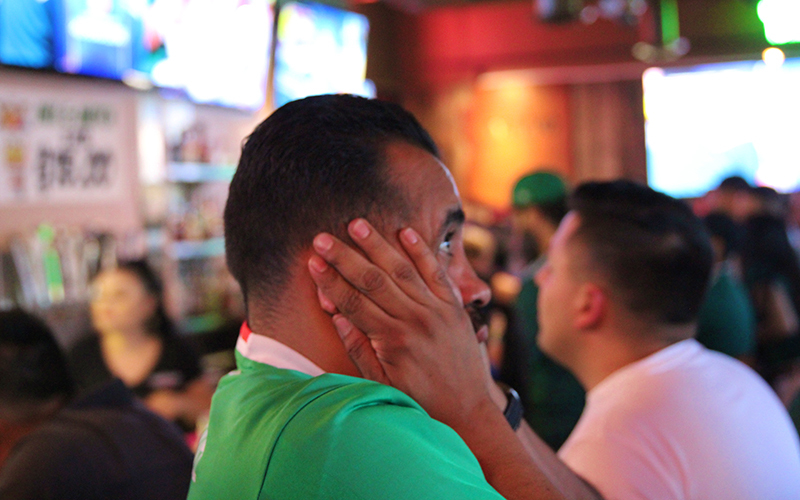 Though “El Tri” (as the Mexican national team is affectionately nicknamed) lost 3-0 to Sweden in its group stage finale on Wednesday, South Korea’s simultaneous upset of defending-champion Germany sent Mexico was enough to send Mexico into the Round of 16, setting off a wild celebration inside the South Phoenix bar. “To lose and still advance, it’s something special,” said an emotionally Zarate, one of the founding members and head organizers of the PVA’s Phoenix chapter, battling a hoarse as he excitedly described the day’s emotions. After a nervous morning, the roughly 300 Mexico supporters in attendance erupted when the team’s spot in the Round of 16 was confirmed. Beer sprayed. Friends hugged. Chants of “si se puede” (a Spanish saying meaning “it can be done” turned into “si se pudo” (a celebratory phrase of success). Mexico supporters Hector Valero, Kenya Morales and Juan Galindo were wide awake and seated at a high-top and surrounded by TVs inside the restaurant at 6:45 a.m. on Wednesday, sacrificing a couple hours of sleep to cheer on the national team before heading off to their jobs. Zarate said that when he arrived at 6 a.m. to begin setting up for the PVA event, fans were already waiting outside the doors. Zarate began following the Mexican team closely in 1999, when it upset world power Brazil in the FIFA Confederations Cup Final in Mexico City. “That’s when (I knew), that fan base right there, I want to be apart of it,” he said. 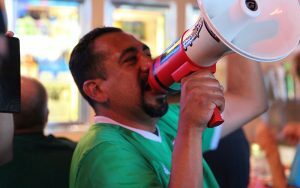 He was part of the group that in 2010 started the Phoenix chapter of the Pancho Villa’s Army, a Mexican National Team supporters group with chapters around the country. This year is PVA Phoenix’s third World Cup together and the crowds for their watch parties have bigger on each occasion, according to Zarate. But it isn’t just Mexico fans that have taken an interest in this World Cup. Bars and restaurants across the city have hosted watch parties of their own this month. A popular English Pub in Phoenix called The George and Dragon has seen crowds as big as 200-300 people, according to its owner, David Wimberley. 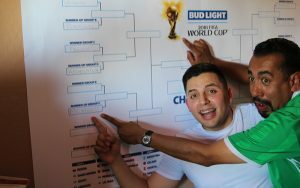 On June 14, close to 50 people piled into the George and Dragon, located north of Indian School Road on Central Avenue., to watch Russia and Saudi Arabia — national teams lightly followed in the U.S. — play in the tournament’s opening game at 8 a.m. on a workday. In attendance that day was Devon Gentry, a lifelong soccer fan from California. Like many, she sees the World Cup as more than a collection of soccer games but as a unifying event worth experiencing. The tournament figures to become more dramatic in the coming weeks, too, as it transitions from the group stage to single-elimination knockout games. Mexico will continuing playing, hoping to advance to a World Cup quarterfinal for the first time since 1986 when it faces Brazil on Monday afternoon. Zarate is expecting another massive crowd.